My mounts were removed from the discovery chassis that donated the engine and box and welded in place by me. ... need for speeds look slightly higher if anything. . 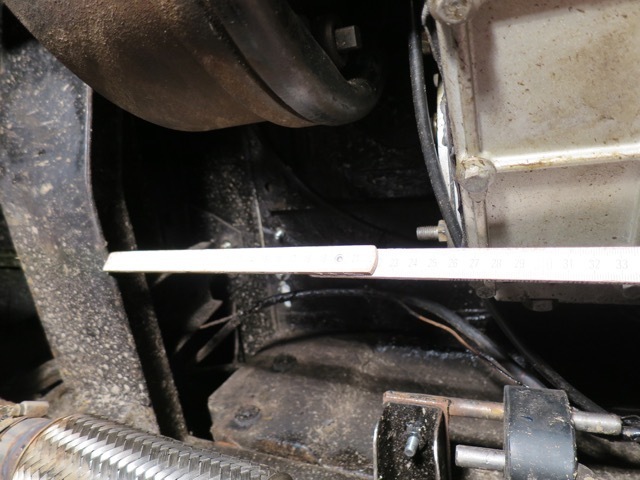 I'm going to make some plates to bolt or weld to the engine mount brackets to bring the rubbers forward by 2". I'll post pics when I've done it case anyone else comes across this in the future. 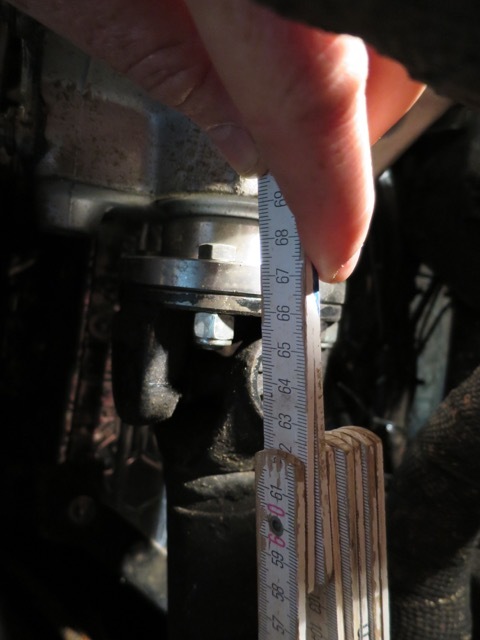 Are you sure your engine will clear the firewall if it sits 2 inches back? I have an efi V8 in mine which was once a 2.5 NA diesel, is also had the LT77 with a long bellhousing and my engine sits in the right place. 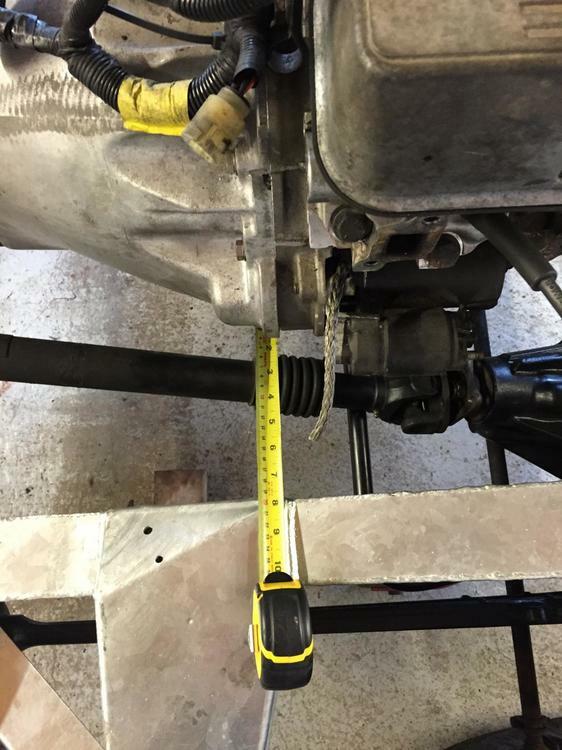 I might be mistaken but looking at your pics your rear gearbox to chassis mounts also seem further back.... Can it be as ash-Whitty suggested that you have the wrong set of gearbox to chassis mounts for your setup? Sounds like you achieved what I was aiming for with my long bell housing and lt77. 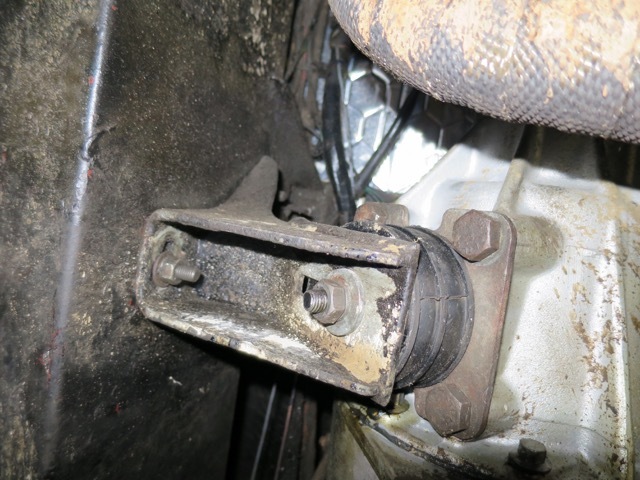 The gearbox mount brackets are from the original defender chassis (lt77 with short bell housing but it for the seatbox etc) so I guess must be right? I am of course assuming the holes for the gearbox mounts on the new chassis are in the right place? Does anyone know a dimension for one from an outrigger or something? ok this is what my gearbox mountings look like, both left and right. 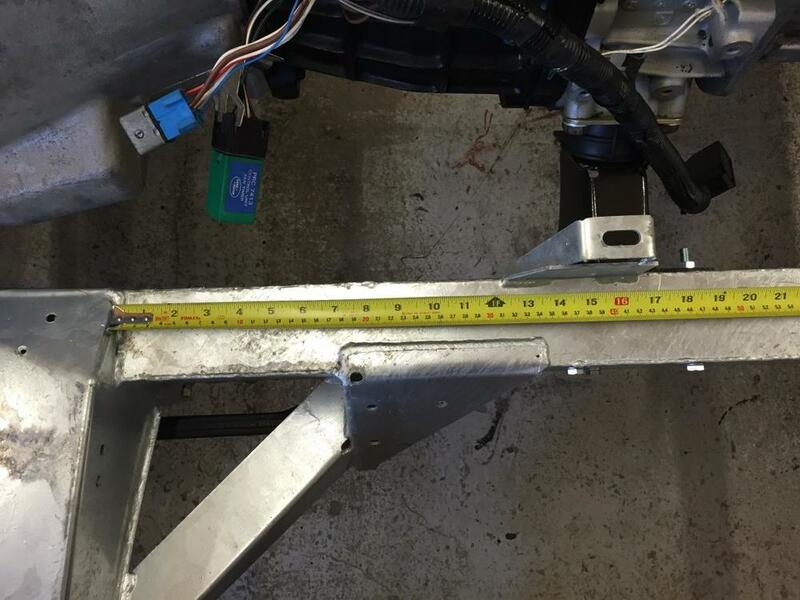 basically the bolt on the mounting lines up approximately with the bottom bolt that goes thru the chassis on the 3 bolts that make a triangle on your chassis. this is the length of my bell housing, aprox 285mm. note that this is a R380 gearbox but they are the same length. the back face of the LT230 is about 260mm from the closer lip of the cross member that goes over the rear prop shaft. sorry you can't see the measurement but at least you can see from where I have measured. if you need any further measurements or more accurate let me know and I will try get them for you. Did you decide what to do David? ? Right, I got some time to go and have a measure. Mine pretty much matches the measurements above apart from my LT77 gearbox is about 50mm shorter and the LT77 bell housing about 50mm longer to compensate. I'm pretty sure the transfer box is in the right place as my original props will fit and are pretty much the same length as above. 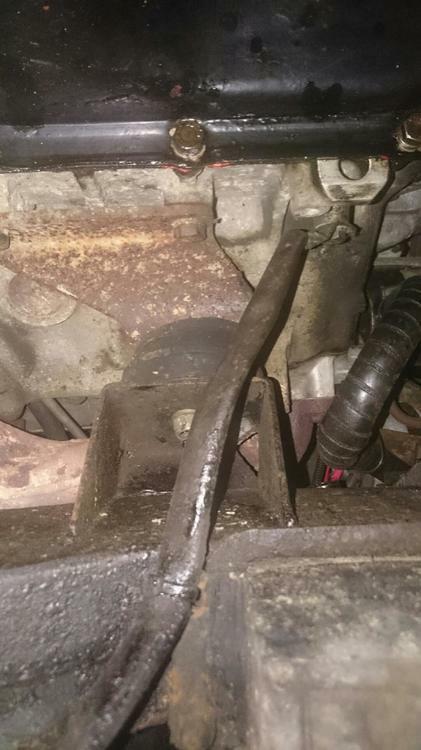 My chassis engine mounts are in the same place as everyone else. Before I go and fabricate some extensions for the engine mount brackets, would somebody be kind enough to check these measurements look right? The end of my bell housing is dead level with the front of the bulkhead outrigger. 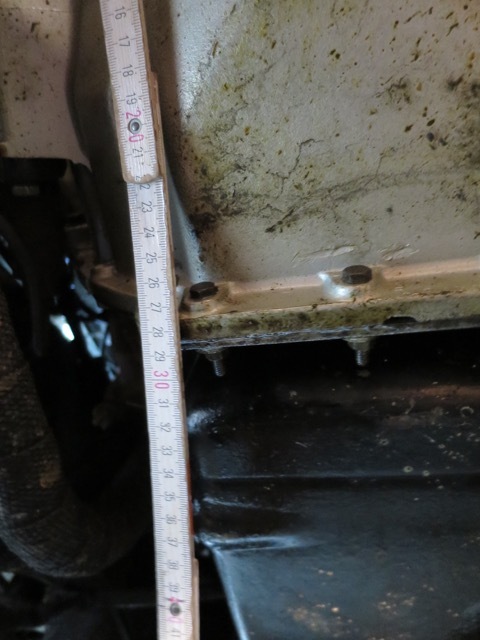 And the middle of the gearbox mount is 40cm back from the back of the bulkhead outrigger. 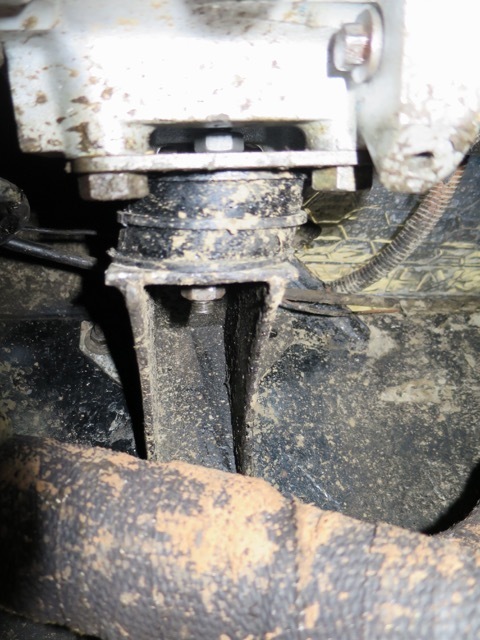 see attached the pic of my engine mount, from underneath the middle of the engine mount approximately lines up with the rear mounting bolts of the axle rubber bump stop. Looking through it you are correct Barrie. 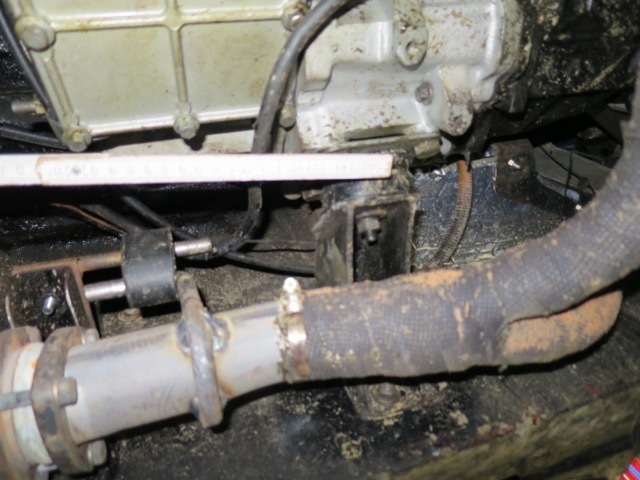 The 300Tdi/V8 Td5 gearbox mounting position is about 2” forward of the old 4-cyl/200Tdi one. 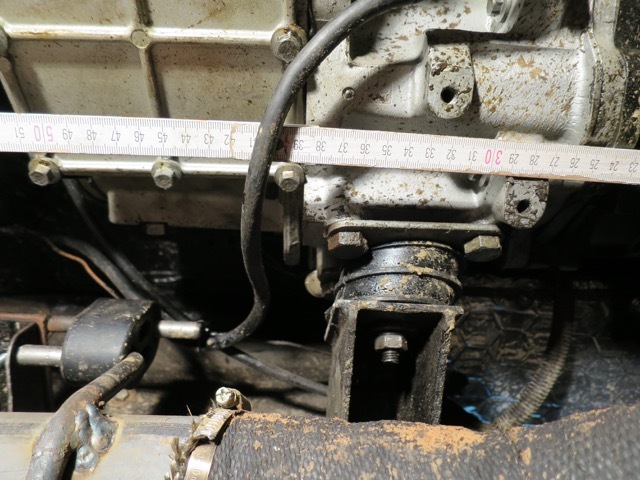 Hence the bulge in the front of the seatbox to clear the transfer box front output housing and the different propshaft lengths. All three options will, used with the correct rubbers and corresponding gearbox halves and with the correct gearbox variant, put the gearboxes and engine in the correct position for the V8, 300Tdi, Td5 or Tdci. I am about to fit a 4.0 V8 auto in a 1991 90 200 Tdi. Does it mean I have to move 50 mm forward the transfer box mounts?? If you want to do it the ‘official’ way then yes. And use standard pipe work etc. for the engine. But leaving the gearboxes where they are means you can leave your floors, tunnel and propshafts standard. At the cost of custom engine pipe work etc. 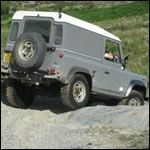 though you may need that anyway depending on availability of Defender V8 stuff.